The West Coast Conference has already seen its Upset of the Year. It came in October when nine of the league’s head coaches made Saint Mary’s their pick to finish atop the regular-season standings – the Gaels’ Randy Bennett not being allowed to vote for his guys. Being favored is no real surprise in itself – the Gaels were 29-5 last year and return four starters, including Player of the Year favorite Jock Landale. But the unanimity is certainly telling. Especially since Gonzaga, which has swept the last five regular-season and tournament titles, won its way to the NCAA championship game last April. Seems rather shoddy regard for the national runner-up, no? But it certainly injects some drama into the season that 2017 lacked, what with the Bulldogs beating SMC three times and cruising through the league, aside from what’s become the annual stumble at home against BYU. The Gaels aren’t just about Landale. Three other starters return, including all-WCC forward Calvin Hermanson, and they have a ready-made replacement for graduated all-league point guard Joe Rahon in Cullen Neal – who originally signed with SMC before his dad became head coach at New Mexico. After stops there and at Ole Miss, Neal is back where he started. Elsewhere in the WCC, Brigham Young’s accustomed spot in the top three will be threatened both by the defection of Eric Mika to a pro career and by San Francisco’s rapid development under coach Kyle Smith. That suggests any WCC pretensions about being a three-bid NCAA Tournament league are premature. In the meantime, keep your programs handy. Last year, four new coaches joined the WCC at Pacific, Portland, Santa Clara and USF. Now that turnover has morphed into massive roster churn. Between old names out and new faces in through the channels of graduation, transfer, signing or being run off, WCC rosters averaged 13 transactions apiece. At Pacific alone, 11 players from the 2017 roster aren’t returning. Portland brought in an 11-player recruiting class. But all that means is that the WCC’s lower-division programs are building for a day when they can muster some roster continuity. For the moment, the story is whether the Gaels can upset the continuity at the top. Outlook: The stunning decision by Eric Mika to go pro and a school investigation into the possibility that Nick Emery received improper benefits clouds the prospects for BYU, where Dave Rose is starting to feel some public heat. The Cougars still have firepower – TJ Haws was all-WCC, Elijah Bryant is dynamic if his knee is whole and Yoeli Childs will be a force up front. See the Gonzaga preview here. Zags’ recruiting evolves, but fit is still key. GU has mastered the art of the rebuild. New Gonzaga videoboard is picture perfect. Outlook: More roster churn and the lack of a top-tier scorer suggest the Lions haven’t turned the corner four years into Mike Dunlap’s stay. The lack of offensive options – Steven Haney is the top returning scorer at 9.4 points per game – means the Lions may try to make things happen with a more relentless defensive style, if there are enough athletes on hand to do so. Outlook: Damon Stoudamire has the transfer express cranked up full, only one reason why 11 players from the 2017 Tigers won’t return. Late grad transfer Namdi Okonkwo is the only man on the roster taller than 6-8, but expect instant impact from Kendall Small, who ran into a logjam at the point at Oregon but will be a handful for WCC defenses. Outlook: Injuries devastated the Waves in 2017 and then graduation took Lamond Murray Jr., so Marty Wilson starts over with some decent sophomore talents – point guard Elijah Lee, burly Nolan Taylor and Kameron Edwards, a gifted wing coming off a broken jaw. But the Waves have to find some defensive and rebounding identity, plus some 3-point shooters. Outlook: Another revolving door in Portland, where there are 11 new faces in a class that got some national buzz, though perhaps for volume. Marcus Shaver Jr., a late pickup after a coaching change at UC Santa Barbara, is a likely standout, with JoJo Walker getting a look at the point. Long Tahirou Diabate grew up in Mali, but became a high school terror in Japan. 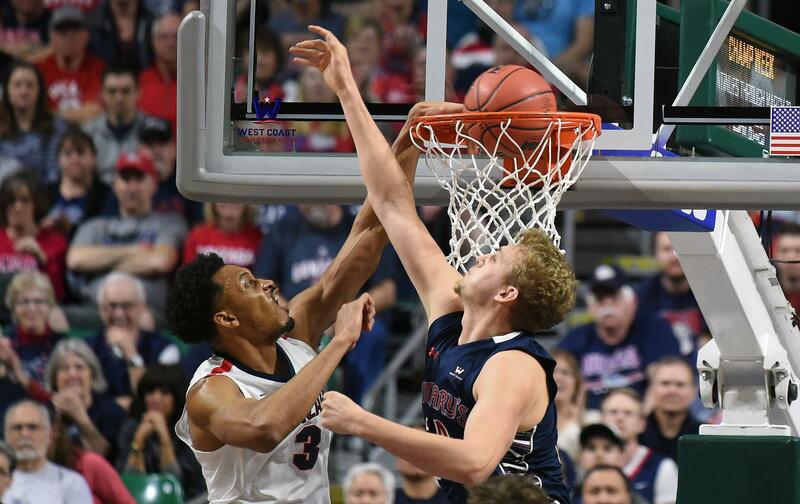 Outlook: There’s a reason the Gaels are getting a lot of love as a pick to unseat Gonzaga atop the WCC: the league’s most veteran lineup, and player of the year candidate Jock Landale and grad transfer Cullen Neal to replace the point guard Joe Rahon. The ultra-efficient Gaels have also become a much better defensive team, though GU’s athleticism will always present challenges. Outlook: Two transfers named Isaiah – Wright and Pineiro – become eligible, which should be a boost to the WCC’s most-painful-to-watch offense. It’ll certainly be a boost to Olin Carter III, who has blossomed into an all-WCC caliber guard. If Juwan Gray or Tyler Williams can make a similar jump, the Toreros could make a little noise. Outlook: The surprise of the WCC in 2017, Kyle Smith goosed 20 wins from a young roster. Serial shooter Ronnie Boyce III is the only real loss and now the Dons have a promising big man in junior college center Erik Poulsen, who will help them do battle against Gonzaga, Saint Mary’s and BYU. Charles Minlend and Jordan Ratinho will make the Dons go, however. Outlook: KJ Feagin will get a new appreciation of just how much defensive attention his old teammate Jared Brownridge attracted by inheriting the go-to-guy label. Matt Hauser makes for a steady backcourt mate, but the Broncos need to find some scoring from newcomer Matt Turner and grad transfer Henry Caruso, who averaged 15.0 points a game as a junior at Princeton. Published: Nov. 2, 2017, 6 a.m. Updated: Nov. 2, 2017, 11:12 a.m.